For three siblings, a stay at their grandparents’ house becomes intriguing when they decide to restore a special music box in this debut illustrated children’s book. Ricky, 9, reckons that two weeks at his grandparents’ cabin is bound to be “pure boredom” since it lacks video games, TV, or the internet. His teenage sister, Sarah, and 6-year-old brother, David, agree, but they have no choice. The first week with their grandparents actually goes pretty well. As Ricky says, “Luckily, I love them a lot”; then there are Gran’s cookies and things to do around the cabin, like fishing, exploring, and splashing in the creek. When the second week begins, Grandpa asks for help cleaning out the barn. Sarah finds a faded old music box that doesn’t work anymore. It had belonged to their mother, a moving-away present from her best friend, and meant a lot to her. Ricky gets the idea to fix it, and though the others are reluctant—he has a habit of not finishing what he starts—they get on board. With Grandpa’s help, they make a plan and carry it through together, sanding, staining, painting, cleaning, oiling, and rebuilding. 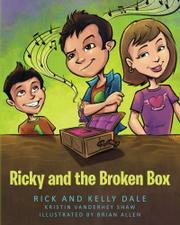 Ricky perseveres to find the last piece needed to make the music box work. Their mother is delighted, and Ricky understands how great it feels to complete an endeavor and see that it matters. The Dales, who appear on the History Channel show American Restoration, know something about fixing up old objects, which they use to good effect. The book, written with Shaw, is especially strong in showing all the steps involved, giving kids a realistic sense of how to break down a project into manageable chunks. Everyone has a chance to be involved and brings different strengths; Sarah, for example, who has experience working on her bike, is given the task of taking apart the box’s gears, cleaning, and oiling them. The box’s importance to the kids’ mother is an effective undercurrent, as is Ricky’s growth in learning how to follow an enterprise through from start to finish. Allen’s full-color, amusing images show members of a Caucasian family whose vivid facial expressions help define their personalities. A subtly instructive, satisfying, and warm family tale.